Heat half the olive oil in a heavy-based saucepan over medium heat. Add the chicken and cook for 3-5 minutes, turning, until browned all over. Stir in the shallot and cook for about 5 minutes. Add the cognac and stir well to combine. Season with salt and pepper, then add the Champagne. Bring to a simmer, cover with a round of baking paper then a lid, and cook for 20 minutes. Meanwhile, heat the remaining olive oil in a large frying pan over high heat. Cook mushrooms for 3-4 minutes or until softened and golden. Transfer mushrooms and chicken to a bowl, plate or tray, and cover to keep warm. Heat chicken cooking juices over high heat and bring to the boil. Cook for 10-15 minutes or until reduced to about ½ cup. Add cream and simmer for 2-3 minutes or until slightly thickened. Return chicken and mushrooms to sauce and heat for 5 minutes until warmed through. 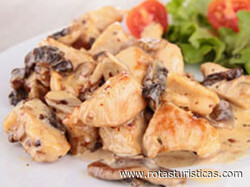 Divide mushrooms among serving plates and top each with two pieces of chicken. Spoon over sauce and sprinkle with chives. Serve with asparagus.